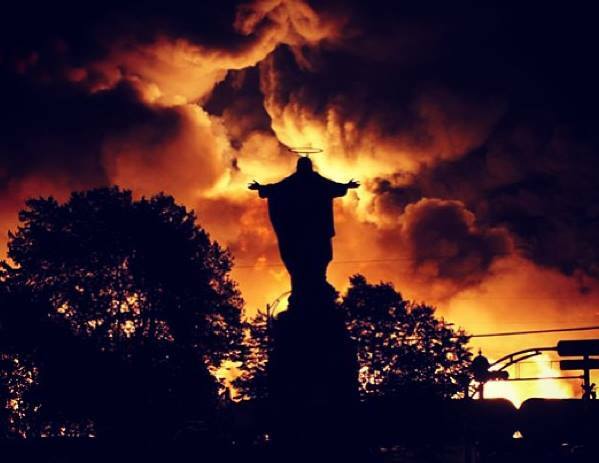 The disaster of Lac-Megantic just make us sound the alarm that we can not ignore! « With our thoughts we make the world, » said the Buddha. I fundamentally believe in the truth of this thought Bouddha.Commençons to understand that the artist would draw no, it does not take the time to think about before starting to draw his esquisse.How a philosopher, a sociologist, an economist, a politician, an entrepreneur, a military strategist or even a farmer or fisherman could succeed in their endeavors without thinking before? Our company is working very hard right now, is the result of our thoughts and our schedules are previous.There are our ancestors who designed and built the base and the development of our cities, themselves, are the basis of the birth and the expansion of capitalism and neoliberalism worldwide. The continuity of the expansion of cities and of neoliberal capitalism on the whole ecosystem of the entire Earth, became, in spite of ourselves, a hereditary factor practically fixed in our génétique.Aussi the Catholic church itself echoed this political vision by calling the faithful to grow and multiply.This message sent, there are more than two thousand years, proves completely false, provocative and suicidal for humanity faces its own extermination. Thus Canada has built, and through the consequences Quebec.He was a joint project to unite the British colonies to the north of the United States of America, and that is why those known to us as until today, the pompous title of « Fathers of Confederation », then decided to take the « iron horse », the train as a means of unification politique.On then sought to bury the French culture in the weight amount of new technology to make money, to get rich by creating from scratch a petty-bourgeois elite affairiste.Nous back on the train, at the end of the article. Capitalism continues to increase well-being of a number of increasingly high people say with one voice the architects of actual neoliberalism .It is why we can say (while crossing fingers) that overall, people live « relatively » longer « , but less than before. The main reason is that these people are in the so-called » Third World « and are less visible to us in the centers of World Western capitalism, while workers in the imperialist centers have their own well-being decrease, as factories are closed and the financial capital exported Furthermore, we see the emergence of phenomena such as the conditions of workers, wages and welfare state that are emptied of their current dollars or diverted. In other words, the reproduction of the working class is made on the basis of the decline in living standards in the imperialist centers when it is carried out increasing levels in the country « so-called emerging Third World, » which shows workers earn higher wages, fetching a rudimentary education, and improving their field of public and private health. This is because different capital requirements. In Western capitalist centers, workers are too expensive to maintain, and since the production can be done elsewhere for much cheaper, why not pay for the maintenance of the working class educated and alert, the home? The capital is certainly suffering from a crisis of profitability, and even though I am convinced that in the long term, the current crisis is the « final crisis of capitalism, » it is important to note the role played by the financial system by operate at full capacity and the fictional virtual capital (claim ownership of capital beyond what is actually happening on a national market) in the real capital, by circulating through the financial institutions and the import-export system. The goal is to obtain loans from foreign institutions and use the interest on the national debt fraudulent fictitious capital to develop pays for the foreign economy. The beauty of the scam in question is the use of the loan on the national debt (and individual) inflated to stimulate demand in the national domestic market to buy the products of this development « artificial and discount « from abroad. All this means that there is no « true own economic crisis » in capitalism since the Great Depression, when the capital was eliminated unproductive and crashed to the ground, removed the fictitious capital market and real capital truly distributed among surviving financially capitals. This is what usually happens when the demands of capital are produced faster than real capital (ie: falling rate of profit), but it is impossible in the current financial system. I want to reiterate that I think the current crisis (and this crisis has been ongoing since the 1970s) is the « final crisis of capitalism, » because we have reached a huge level of productivity, I do not see what kind of Great Depression, even correction can actually intervene to get rid of this problem. Rather than restore production to a level where further increases in productivity produce more capital that claims to capital (the banksters and thieves real estate), I expect that any correction will only lead to a purge of existing stocks of fictitious capital, but never « reset » the production of fictitious capital. However, it is important to note that it is always possible that the impossible happens. Capitalism therefore needs a large number of workers and unemployed workers to keep wages at the bas.Il is therefore, as a mere commodity, adjust the law of supply and demand . This social and political context, these ways and this philosophy to exploit his neighbor, as a commodity, form what we call the « neo-liberalism », and as long as the causes remain, liberal ideas that the Great Recession and the global financial crisis of 2008 to today, brought the end of neo-liberalism are simply absurd and out of context related to réalité.Il is an invention marketing experts of high finance internationale.On seeks to make friendly, businessman playing with public money. This system has no soul or conscience: it merely react, like a predator to prey movements he has on hand, and in this case we are talking about workers’ moyenne.En class of standardizing the value of life, it also seeks to find a solution to the diversity of environments and cultures humaines.Ainsi neoliberalism did not hesitate to condemn to death the workers of Detroit. The neo-liberal austerity, increasing its power since the global financial crisis has had a disproportionate impact on women, particularly along the boundary lines of social class. In other words, it reduces the social and economic power of a multitude of women, but the most wealthy. Far from uniting the philosophical and social idea of ​​feminism, oppression neoliberal hypocritical and insidious was divided according to social classes. Women constitute the majority of the working class itself, now in 2013 in Quebec and in several western countries. In the foreground of the rich and famous class, this way is not related to the principle of denying the specific experience of being sexual as « late » capitalism. Moreover, to understand sexism as part of the reproduction of capitalism, as I do, it is to open possibilities of emancipation throughout the world or the need would arise. Therefore, advocates of this type of neoliberalism Western, they looking for a way to assess and standardize the « value » of a woman and that of a man in the obvious interest in reach a utopian egalitarian value, because it is clear that in countries such as Quebec or feminism tends to crush everything around him long ago that the value of women exceeded those of white males, speaking French and having more than forty ans.On sometimes wonder Quebec, when you’re a man, if we have a future here, because it seems to live in a world of revenge or even corrupt judicial system seems to preference to women in this society in moral decline. A young man to be comfortable and feel to enhance, in Quebec in 2013, it must be either a macho wearing his hat backwards, chewing gum or be gay, in giving a feminine style, consistent with stereotypes our consumer society, stereotypes borrowed from American society. To change the system or were well integrated stereotypes of social evolution, preaching overproduction and overconsumption, it takes both down machismo and feminism by proposing a better system based on respect, the love, sharing and discipline. Sooner or later, he will have to make a decision against our avenir.Ceux which, as the current elected politicians. Sitting in the National Assembly of Quebec, continue to play the ostrich trying to ridicule those who like me and many citizens exhausted by over fifty years of neoliberal governance, seeking a real solution to the moral problem of our society, will find themselves in an awkward situation, the day they finally decide to head out of the sand . If we do nothing, and this is the easiest way to send the problems, we will be guilty of abandoning many generations of Quebec and Quebec to come to meet the needs of a small shameful bourgeois elite « baby boomers », determined to keep her big privileges intacts.Cette small elite has the greatest need to transmit and perpetuate the welfare state that has so cleverly kept at arm’s length, too long already. Recent events in the accident « Train of Death » of Lac-Megantic, July 6, 2013, we show how well our human life is fragile and how it fails to address the « big responsibility » oligarchic capitalism . Pauline Marois would never have taken the decision to seize the assets of the Company and Montreal Maine Atlantic.Nous see very well reading the news this morning that we did not wait for the process of bankruptcy the company owned by a multibillion shameless! The capitalist system in place in Quebec since the Quiet Revolution false and enabled the construction of the current welfare state, knows that his heart is sick and going to die, but it seeks to project the picture « that we keep control of the situation. » must be totally stupid to believe that no matter who was Prime Minister at the moment (Couillard, Marois and Legault) someone to take care of our interests on top the pyramide.On could have the Great Lord Illuminati Sagard the control of the state that would have the same result as we see. None of them would dare to send this capitalist gangster behind bars after entering all of the property he owns in Quebec. In Quebec, we have more than twenty years in arrears, at the judicial level, compared to countries such as France, Spain and Germany as these countries did not hesitate to bring the perpetrators to arrest, as to ensure their safety and to ensure the investigation of the facts. We are administered by cowards services Crime organisé.Pas wonder they are afraid of the People’s Justice and Civilian Disobedience .They only trying to gain time in the hope that all citizens will continue to sleep comfortably under the effects of chloroform addiction and stupidity related to stressful work. The New Era in which we have just begun to live, will slowly open the door to a vast world revolution, as it has now become a matter of life and death for all mankind, including Quebec in too! The New Era bring the concept of capitalism or free there and then, neoliberalism have introduced legislation to pay for survival is the fittest, changing the diversification of the Jungle in which man seeks to s’ adapter.Des thousands of men and women lived in misery to allow a small caste die obese and satisfy his vices and sometimes criminal perversions. The New Era abolish philosophy of capitalist competition by developing the challenge of working for survival, the public interest and the protection of ecosystems and species diversity. Protection of genetic integrity of all life forms entering the Vision of Change Humanity, Interior by Compassion and Love! The New Era, to settle, should promote justice to overcome injustice, because the World needs a big shot balais.Nous not have to be afraid to physically get rid of mafia criminals, responsible for wars, those who commit crimes against all humanity and all life forms on Earth, by making the wrong life to control the life of Futur.Je therefore condemns those responsible for Monsanto this World, to undergo Justice of the People Human Earth and sentence should be the death penalty … nothing less! The New Era will begin by establishing a huge global court, whose sentences will be executive immediately, without appeal, because time is against humanity and as we see, extreme weather events are increasing in number and intensity. The flexibility that we have to ensure a continuity of the human adventure on Earth, will taper off. Continual disasters we apercevont recent years in our newsletters (floods , forest fires, the sinkholes, the tsunamies, pollution, etc.) are the result of decisions made in closed offices powerful controlled by our current Masters World and our neglect to let them control our lives multinationals. The New Era will promote the truth to achieve freedom, even in the establishment of its overall plan to propose an alternative to the management of the World, the New Order Mondial.Nous have to judge and condemn the death penalty while àè member of secret society that contributed to the enslavement of humanity and the destruction of the environment humain. All officials related to the New World Order, will be tried and convicted of high treason against the whole humanity full and all forms of life on the planet, their punishment will include the elimination of all their families and their descendants to make room and avoid a resurrection of their satanic system. The Illuminati wanted to eliminate the world’s population to restrict it to 500 million people, for it is the number scientifically established that the Earth could sustain if we abolish fossil energy to perpetuate the current capitalist civilization of endless economic growth. Without being vengeful New Era begin the great cleaning, even those who we want to develop: it is to get rid of dangerous criminals, which we can do without, changing system. We have to choose between Liberty or Death! … Between Truth or Lie! … Between Love and Hate! … Between Justice or Injustice! … Between the Past and the Future! … Between Dark control the New World Order or Light Stewardship New Era! Long Live the Revolution Quebec Patriotic People! Long live the New Era! ‹ PrécédentECONOMIC ALERT: Will Chicago Follow Detroit Into Bankruptcy?